Question: My check engine light is on and my boyfriend thinks he can get the code read and know what part to replace to fix my vehicle. I say, it’s not that simple. Who’s right? Express Car Care Answer: Good news – you are! Let’s look at it logically: there are hundreds of things that can go wrong with your vehicle. Some are simple and some are quite complicated. It’s a common misconception by drivers that the trouble code will tell you exactly what is wrong, but for any given trouble code there are any number of faults that would trigger that code. For example, a code indicating a misfire on cylinder three could be due to a bad spark plug, a failed coil, ignition problems, compression issues, and others. Each of those possibilities requires additional diagnosis to confirm or rule out a cause. Once a trained service tech with access to state-of-the-art diagnostic tools and extensive research databases is able to nail down the problem, then he can set about getting it. A complicated diagnosis may take some time. Your boyfriend might be tempted to bypass a diagnosis charge by taking a trouble code reading with an inexpensive scan tool and start replacing parts. He might get lucky…but chances are you’ll end up spending more time and possibly more money, than if you went to a professional with the right equipment. A final word – a “flashing” Check Engine Light indicates that a condition exists that could lead to serious damage. You should get your vehicle into a shop right away. 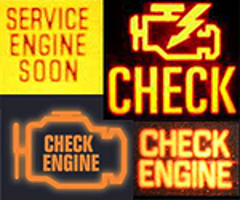 A steadily illuminated Check Engine Light is less urgent so you can get it checked at your convenience. But keep in mind that a minor issue today can become more serious tomorrow, if left unresolved. Give us a call and let us help. Hello drivers, today we’re going to talk about your fuel system. The fuel system on your vehicle encompasses everything that it takes to get the fuel from your tank to your engine. It starts with your fuel pump, which is located in the tank, then there are fuel lines, a fuel filter, a throttle assembly and fuel injectors. When all of these parts in the fuel system are clean, fuel flows as it should and gives you a good and strong engine performance. But when your fuel injectors, valves and fuel intake are clogged or gummed up, your engine doesn’t run as efficiently and its performance will suffer. The fuel in our vehicles just naturally gums things up over time. The government requires all fuel to have detergent in it to help clean the fuel system, but not all fuel is created equal. Bargain fuel may just have the minimal amount of detergent to meet the government standards, so using a good quality fuel that may have several times the minimum amount of detergent will help you have a clean fuel system in your vehicle. Sometimes, even if you’re using a quality fuel, your fuel system can still get too dirty and you’ll need a professional fuel system cleaning. If your vehicle has lost some of its zip, or is sputtering a bit, it could be because of a dirty fuel system. Your helpful and knowledgeable Express Car Care adviser can check it out and tell you if it’s time for a fuel system cleaning. I was driving on a local Denver freeway and my truck started sputtering and then the engine finally quit and I couldn’t get it started. I was towed to a shop in Denver and found out I had to replace my fuel pump. This is a tough one for Denver drivers because there isn’t any maintenance recommendations for fuel pumps. They’re inside the fuel tank and you really can’t get to them without removing the tank. 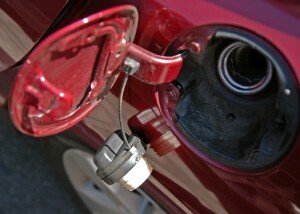 But Denver motorists can do some things to make the fuel pumps job easier so they last a little longer. 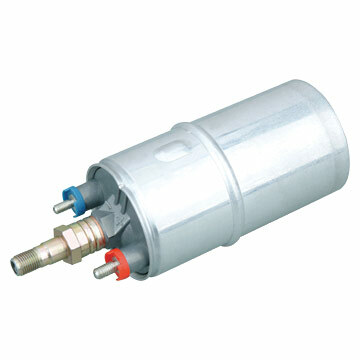 Many newer vehicles driving around Denver have their fuel filter inside the fuel tank so it cannot be changed. A good tip for car owners is to not run the fuel tank too low – this can cause fuel starvation that excessively wears the pump. Also, you can’t go wrong using good quality gasoline with high levels of detergent. This helps prevent the buildup of varnish and gum all along the fuel system. All these things improve fuel economy and increase performance for Denver car owners. Ask your helpful Express Car Care service specialist if a fuel system cleaning is recommended. I’m Alex. My Check Engine Light came on in my truck and I’ve tried several things to make it go off but nothing has worked. What should I do? Like Alex, most Denver car owners have experienced their check engine light coming on suddenly. We get frustrated because we don’t know why. Of course that’s perfectly understandable: There are many reasons for the check engine light to come on – and there’s only one light. Alex said she tried several things to get the light to go off – but it didn’t work. Her goal was to get the light to turn off. I would suggest that the goal should be to find out what caused the light to come on in the first place – and fix it. You can search the internet and find millions of sites with tricks to get your truck engine light to turn off. But what good does that do? Whatever caused the light to come on is still wrong. Not getting to the bottom of the problem can lead to other problems for Denver motorist – some minor and some more serious and expensive. Your helpful Express Car Care service professional can get you started down the road of properly diagnosing the problem so you can have it repaired. You can save yourself some time and frustration next time by having a professional diagnose the problem right away. Express Car Care Tech Question: I was driving down the freeway in my car and smoke started coming out from under the hood. I pulled over and called my husband. I had to be towed to my Denver mechanic. He said my car had overheated. What can I do to prevent that in the future? 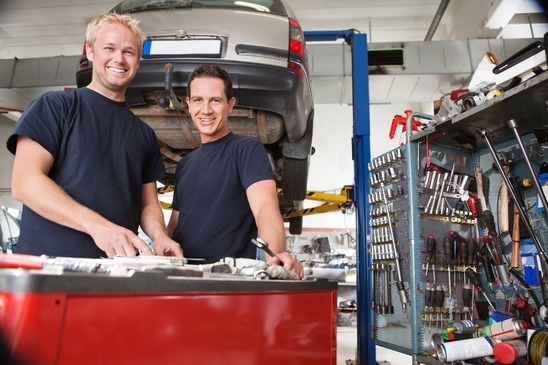 Express Car Care Answer: It sounds like you had a rough experience. Unfortunately overheating is the most common engine failure for Denver motorist. It’s also one of the easiest to prevent. The basic idea is this: you need to keep enough coolant/antifreeze flowing through your vehicle’s engine to keep it cool. Problems come for Denver drivers when they develop leaks in their systems – like in the radiator or a hose – and the coolant leaks out. Sometimes the coolant gets so contaminated that it blocks up the radiator so the coolant can’t get through. If that happens enough you’ll end up broken down on the side of the road. Your owner’s manual recommends a schedule for coolant replacement. That’s because your coolant actually becomes corrosive over time and starts to eat away at the cooling system, causing leaks or blockages. New coolant stops that process. Ask your helpful Express Car Care technician about inspecting your vehicle’s cooling system for leaks, spongy hoses and other damage. If it’s time to replace your coolant, hoses or other cooling system parts, have it done right away at Express Car Care in Denver. Prevention is the key. The engine in your vehicle really needs clean air to operate efficiently: it takes about twelve thousand gallons of air to burn a gallon of gas in your engine. And clean air is much better than dirty. When your air filter’s dirty, it simply can’t trap anymore dirt, so the dirt just passes through into your air intake system. From there it can get into the truck engine combustion chamber and burning dust and pollen in your engine as you drive around Denver doesn’t do you or your engine any good. The verdict: when your engine air filter needs to be replaced; it needs to be replaced. How often depends entirely on how dirty the air is in Denver or wherever you drive. A simple visual inspection by a courteous Express Car Care technician will tell you when you need a new engine air filter in your vehicle. When you look at the air filter on your furnace in your home and see it’s all clogged up with dust and dirt, you don’t hesitate to replace it, do you? So don’t wait until your air filter (furnace or automobile) is totally plugged – by that time you’ve been running inefficiently for a lot of miles. When your Express Car Care service technician brings out your nasty engine air filter, you now know why you should go ahead and change it out. Question: My car failed its emissions test – what do I need to do? Express Car Care Answer: First of all, let’s make this clear: A leak in your exhaust system could be deadly! 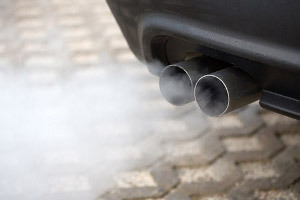 If Denver drivers smell exhaust in the passenger cabin or hear an unusual exhaust sound, they should get their exhaust system checked and repaired as soon as possible! Talk to your helpful Express Car Care service adviser. And this is information is critical – Carbon monoxide in your exhaust is odorless, colorless and tasteless and can be fatal to you and your passengers! So don’t delay if you suspect an exhaust leak. There could be a number of reasons for a failed Colorado emissions test, so some important diagnostic work is in order. A common reason for Denver drivers is that the catalytic converter has failed. The catalytic converter removes some of the harmful elements in exhaust. When a catalytic converter fails it must be replaced, which isn’t cheap for an auto owner. Many people stop there – but the converter failed for a reason. There may be any number of engine-run conditions that led to the failure. It would certainly be smart to have your Express Car Care service professional diagnose the cause so that you don’t end up with another expensive catalytic converter replacement down the road. And let’s not forget that check engine light that so many car owners ignore. It might just be illuminated for a critical condition that could lead to catalytic converter damage. Have your service professional get to the bottom of any check engine light situation. Batteries are a huge part of modern life in Denver and across the country. I mean, how many battery chargers do you own? But our purpose here is to talk about your car battery. When people come into our Denver service center and need a new battery, they’re really not that happy about having to spend the money. But the fact is that 70 percent of batteries don’t last four years. There are some things that you can do to extend the life of your battery. First, keep it clean. If you see it getting dirty or greasy, let us know at Express Car Care and we can clean it off. A dirty battery runs hotter and that shortens its life. If your battery terminals are corroded, let us take a look at that too. We can clean them, and if the corrosion has gotten into the battery cables, we can replace them. Also running your battery way down is not good for it: Things like running the headlights or watching a DVD player when the car is turned off can deeply deplete car batteries. The typical battery can only take about 10 of those deep cycle depletions before it gives up the ghost. Now when it’s finally time to get a new battery, we can help you find the right replacement. We’ll always make sure to meet your manufacturer’s recommendations. And if you have special needs – like living in a very cold climate or running a lot of electrical accessories, we can look at an upgrade that will give you the power you need. Let’s address a very important maintenance item for everyone in Denver – timing belt replacement. It’s important because letting this one slide can lead to very expensive engine damage. 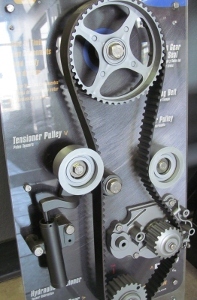 Your timing belt choreographs the timing of your combustion process. Your pistons travel up and down in the cylinder. Intake valves open at the right time to let in air and fuel, they close at the right time to allow the fuel to burn and then the exhaust valves open at the right time to let out the exhaust. All these things happen thousands of times a minute and it’s your timing belt that makes sure the valves are opening and closing at precisely the right time. If the timing is off, your engine won’t run. And that’s the best case scenario. The worst case is that a valve is opening at the wrong time and collides with the piston. The result is bent valves and maybe even more damage to the cylinder head. Repairs can run into several thousand dollars. 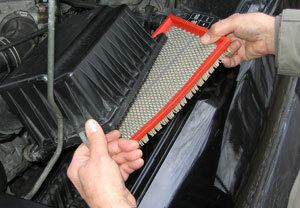 Timing belts just wear out naturally so you want to replace a worn belt before it slips or breaks. Check your owner’s manual or with your service adviser at Express Car Care in Denver to see when they recommend you replace the timing belt. If you’ve never replaced your timing belt and have 60,000 or more miles on the clock, talk with your service adviser right away to see if you’re due. Timing belt replacement is one of the more expensive routine maintenance items on your service schedule. But not replacing your timing belt can lead to some of the most expensive repairs you’re likely to ever have. 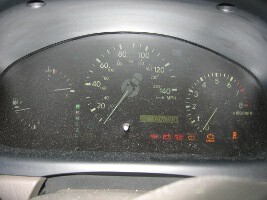 Many Denver drivers have had their check engine light come on. It’s an amber colored light that shows on your dashboard. In newer vehicles it might just be a problem with your gas cap not being screwed on tight enough (or a worn gas cap), causing the vehicle to fail the self-diagnostic emission test. All you need to do is go to your gas cap and verify that it is tight. If that was the problem, the light will turn off and everything will be fine within one or two days. 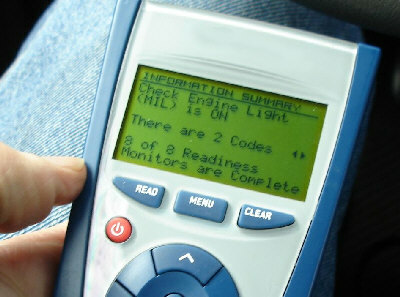 Resist the temptation to have someone “clear” the codes to turn off your vehicles check engine light. This erases important diagnostic information that your helpful Express Car Care technician needs to diagnose the underlying problem for the check engine light – and any other pending problems that may be stored in the car computer. If the problem is still there – you still see the light – bring your vehicle in to Express Car Care in Denver and have your check engine light diagnosis as soon as possible. Come in and see us at 4200 E. Evans Ave. Denver, or give us a call at 303-691-2760 and we’ll see what we can do to help you.